This pack contains ISO22301, the BCI GPG and Via-C - the three publications essential for those completing the BCI Good Practice Guidelines CBCI course, or those embarking on a BCM career. 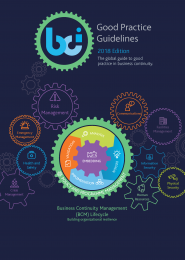 The latest edition (2018) of the Business Continuity Institute's Good Practice Guide. This is recommended reading for those wishing to take the BCI Licensed Good Practice Guidelines Course and as essential revision for the BCI exam. These publications are recommended reading for all those taking the BCI Licensed Good Practice Guidelines course. Business Continuity Training (BCT) uses a ‘worked example’ throughout our courses: an imaginary training company called VIA-C. This allows students to practise their newly learned business continuity skills against a ‘real life’ company and also gives them a set of business continuity documents so that they can compare their answers with a worked example. For more information about this please click here.